Our first new product for May is a rear rubber mat for a 1966-1977 Ford Bronco. 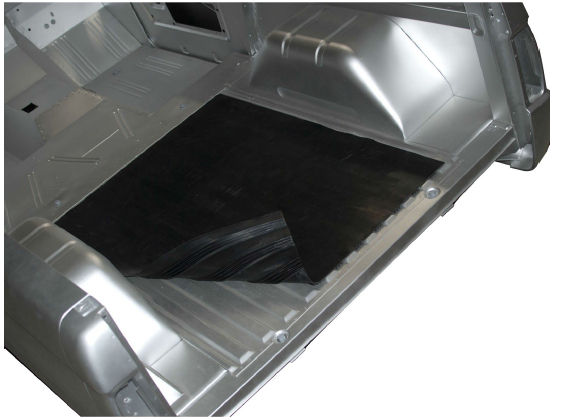 This exact reproduction from Dennis Carpenter Industries was originally used under the rear floor mat or carpet to smooth out the ribbed bed, but can also be used as a sound deadener to help quiet down interior noise. Made from long lasting heavy duty rubber, this mat drops in easily and fits perfectly in the bed section behind the rear seats of your truck. The mat comes marked, but not cut for factory rear seat mounts and seat belt mounting holes. You’ll find this quality Ford Bronco part and more for any classic Ford Bronco or full-size Ford truck restoration here at the Bronco Graveyard. We’ve got you covered with the hardest-to-find and best quality parts you need to restore, rebuild, maintain, or service your truck. We’re always adding more, too. Checking back next month for another batch of exciting new products only from the Bronco Graveyard.